Unfortunately there is no Latin word for hairdryer. Maybe I could call this Sacri Babyliss. That’s basically the brand of hairdryer that I referenced. I did use my networking skills (ie, I sent out a mass e-mail asking for help) to find a Latin teacher with a sense of humor. She really got what I was going for and had a lot of fun playing with translations. She actually came up with 3 different ways to say “Business in the front, party in the back” in Latin. I guess that means I have more paintings to do. I did bring her my dilemma about the word for hairdryer. Her suggestion was: Siccativum crinis, dryer of the hair. Sounds good to me! 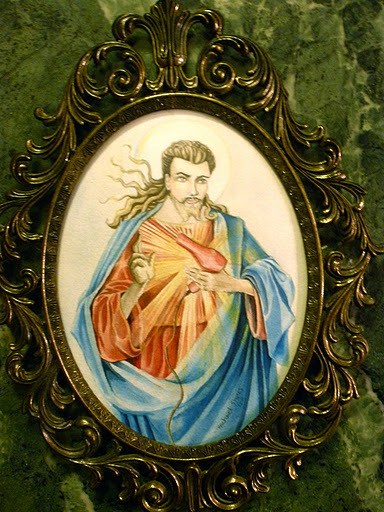 This painting is copied from Sacred Heart paintings with a New Kids on the Block inspired mullet. After painting this I decided it didn’t need a Latin banner. What I did like was trying to paint this at open studio. Open studio is a new thing that I attend as a way to get some scheduled painting time in. Other retired artists attend as well. I was very worried about what these sweet people would think of this blow drying foolery. To my relief most onlookers didn’t even notice the difference until the second time they came around the class room. The frame I found and purchased in Minnesota. It is one of only two and I redesigned two of my mullet paintings to utilize these beautiful frames. It’s curved glass! I can’t get over that. I was thinking of painting the frame to funk it up a little bit but this looks so authentic that I just couldn’t do it. If you think the frame should be painted you’ll just have to buy it and paint it yourself. This is print is for sale at my Etsy shop, SparrowsHand. This is part of a show that is now up at the Beehive.